Camfil USA now offers air protection screens manufactured in USA. Surrounded by trees and busy roads, many buildings have rooftops easily accessible to debris from fauna and the like. Air intakes and coils quickly become fouled reducing the efficiency of the HVAC equipment, necessitating costly maintenance and wasting energy. Air intake protection screens are simple to measure, install, and clean. Installation can be performed by Camfil or by your own personnel. The most popular installation option is the aluminum channel track mount system which is secured around the perimeter of the air intake or condenser coil. Once the channel has been installed, the air protection screen is positioned, and the easy twist-lock fasteners are turned to secure it to the equipment. A quick visual inspection is all that's required to check whether the screen needs cleaning. Removing debris only takes a few moments. Simply clean with a soft broom or brush, or use a portable vacuum or hose. Even the rain can rinse the screen clean. Air protection screens can be fitted to protect every type of HVAC plant including AHU and intake louvers, chillers, condensing units, and cooling towers. 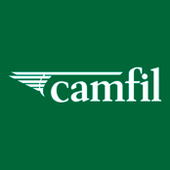 Camfil is also one of the most global air filtration specialists in the world with 26 production units and R&D centers in four countries in the Americas, Europe, Southeast Asia and the Asia-Pacific region.